STAYING ALIVE: Belinda Reid and Dania Brown share a rocky mother-daughter relationship. You can't help noticing the striking parallels between the stark realities facing Claireece 'Precious' Jones (the protagonist of Sapphire's groundbreaking novel and the Oscar-winning film Precious) and Tiffani Palmer, the young heroine at the centre of Fabian Barracks' new domestic drama, Force Ripe, played with enormous empathy by talented newcomer Dania Brown. The unimaginable verbal abuse and sexual assault they both suffer at the hands of their guardians is nothing short of cringe-worthy. But, thankfully, these girls possess courage, a thirst for knowledge, and quiet inner strength that buoys them up in their fight for survival. 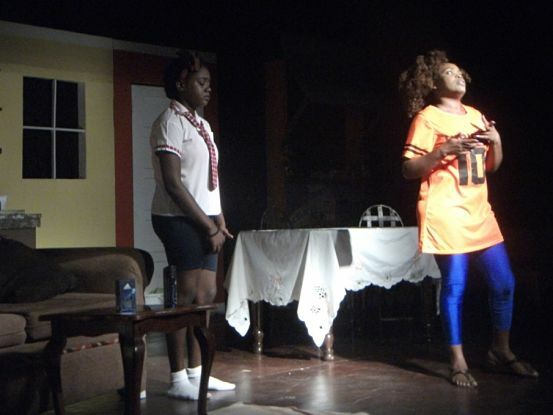 In chronicling the wrenching story of 15-year-old Tiffani, a girl trapped by circumstance, Barracks weaves a tale that occasionally feels overheated and formulaic, but its overarching message and moments of gripping dramatic tension (balanced with a healthy dose of 'ghetto' humour) turns it into a potboiler that dually entertains and speaks powerfully to issues too often swept under the rug. Tiffani is a likeable and well-mannered girl who wants nothing more than to sit and ace her CXC exams. Trouble is, mommie dearest (Belinda Reid as the monstrous Cherry) sees education as a waste of time and money and keeps her daughter away from school to toil like a slave for her and her latest lover, Mikey (Andre Bennett), a constable of intimidating height and stature. He preys on Tiffani behind her mother's back and before long things get out of hand. Tiffani cowers in fear but luckily she has a hotheaded 'guardian angel' in the rotund shape of Miss Cora (Dayna Stewart), the no-nonsense shopkeeper who takes an interest in the girl and raises Cain when she discovers the horrible treatment she's being subjected to, including the mother's brazen act of introducing her daughter to street prostitution. Needless to say, the action crescendoes to explosive proportions, and though we know how the story must end, Barracks makes it a wild and intriguing tsunami of emotions.